It feels great to say it: Permanent Style 2015 is now live, and ready to buy. You can place orders here. I know the first few have already gone, to some inquisitive readers who were searching around the Hanger Project site (who are doing all fulfilment and distribution), but there are still plenty left. 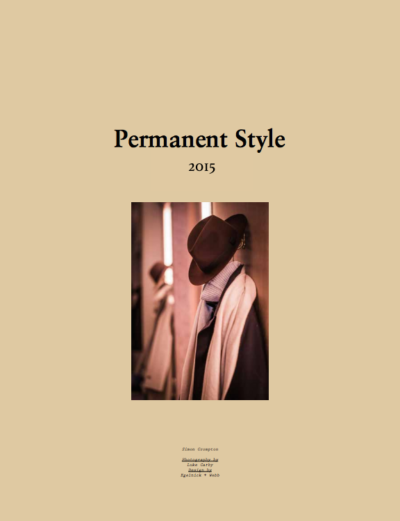 You can follow the discussion on Permanent Style 2015 is live! ..How to buy by entering your email address in the box below. You will then receive an email every time a new comment is added. These will also contain a link to a page where you can stop the alerts, and remove all of your related data from the site. Trying to place an order on their website however it won’t let me continue without a US state being added, given I have entered UK as the delivery address I have been somewhat snookered! Can you be more specific and I will get them to reply. Are you in ‘Billing information’ for example, and you get an error message if you click ‘Continue’, even though you have selected the United Kingdom as the country? On entering as a guest to place an order, one is presented with a form to complete the bill address, in the form there is a drop down box entitled “State/Province” which is a mandatory field and mark with an *. Unfortunately with out selecting a US Sate or Province (i.e Alabama, New York, Idio etc..) one is unable to complete the order. So if you are based in the US it’s fine but for people outside the US will have trouble. I have spoken with Marisa and she said she had received other orders without any problems. So it may be because I am using a Safari browser or perhaps because I checked out as a “guest” rather than registering, but then I am just summonsing. Phoned, very helpful, order placed, and they are looking into the website error. Ken – make sure that the correct country is selected, which would eliminate the need for a state. We’ve had a bunch of UK orders already, so it shouldn’t be an issue. If you are tring to use PayPal, maybe try using a credit card instead. Thanks Kirby, I did indeed select United Kingdom (honestly I am not quite that silly 🙂 ). If you let me know your email address I can send you a screen shot. Will Kevin Seah in Singapore sell copies? Thanks for the reply! Can I check how long the book takes to ship out? Actually ordered a copy 3 days ago and it still hasn’t shipped. Is this usual? Jamie – we’re working on this, but it takes forever to open a bank account in the UK! Hoping to have .co.uk open soon. Sorry, Mike, but glad PayPal worked. Maybe a fraud alert issue because we’re processing from the United States at the moment. Simon. Nowhere in the city. Payment made, book ordered and order accepted. It was an estimated process. Tried to order from this site but I’m afraid it defeated me. There was no promotional code for reduced delivery and they tried to stiff me with some bizarre number. When you have registered and got to the Shipping Method section, section 4. I got to that point but a drop down menu allowed me to put UK into selected country and it was plain sailing after that. Moments ago, I succeeded in placing my order from Abuja, Nigeria, using a local charge card, requesting delivery here. Everything went very smoothly. Simon, you’ve become the bane of my existence. As an elderly, former clothes horse, I thought my days of serious dressing were over. You’re causing me to re-visit that position. Thanks!!! I think!!! Congratulations Simon! 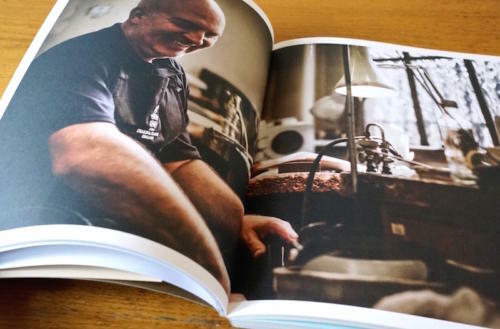 The book looks fantastic and I’ve just ordered my copy – looking forward to getting it. Would we available on the shelf in Dubai? Kinokuniya by any chance? It may be worth mentioning that book buyers should avoid the shipment estimate step that is chronologically before the checkout because I think pressing on this negates the special shipment rate. I bought your new book via The Hanger Project. Thank you for giving directions and I am looking forward to reading your latest thoughts. I hear the centrefold is J. Adler: is this true? 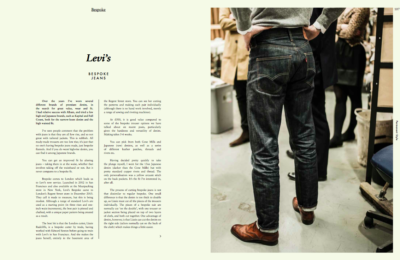 I am interested to know more about the bespoke Levi’s jean.How do I go about if I am to place an order.Please give me some guidance. Just a quick question on fabrics – what are the pros/cons of worsted flannel weighing 7-10oz? Will it work for a suit, or better left for jackets? I bought mine on Thursday morning using PayPal. No problems…. Look forward to getting it. I will of course be purchasing a copy but i am disappointed with your patronage to the USA when the book was designed and printed in London – but then shipped to the USA for selling particularly given the issues with the ordering that seems to be occurring, (i have experienced this on many USA websites as they do not seem to recognise that there is another world outside of the US)! This was surely a bad plan, unpatriotic and against all sustainability! They are being distributed in the UK and US Bradley. And there are very few retail sites that have both UK and US distribution. Congratulations on the book. Will this be something you will be doing every few years? Just ordered two copies with shipping for Denmark. No problems with ordering, paid with paypal. Now I just look forward to receiving them. Never underestimate the curiosity, interest and buying power of your African readers and market. Should I call Trunk to see if they could help me or is there any other way around it? I’m very much looking forward to reading my copy once it arrives. Are you planning on traveling here to the States in 2015? I’d like to have you sign my book. An event at Leffot or Paul Stuart would be really nice. I live in Washington, DC but with some planning I’d be happy to come up. Both shops are challenging to my wallet, but what would life be without a little danger. 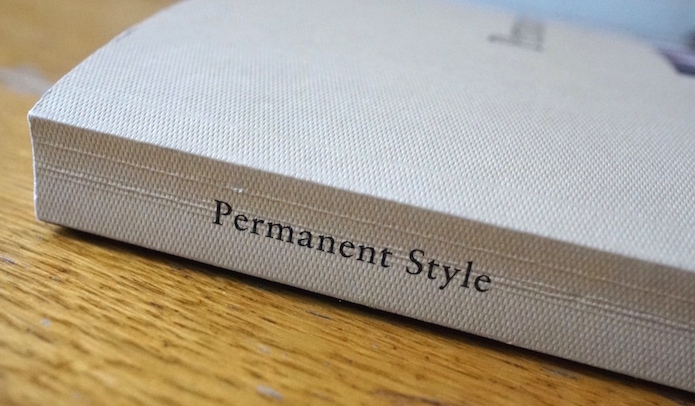 I am thoroughly enjoying my Permanent Style Book 491/2000. 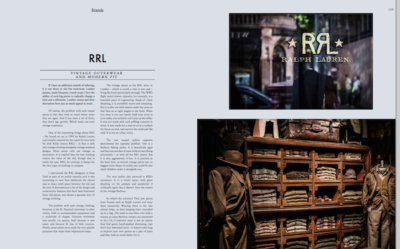 It lifts already fascinating blog information and insight to a higher level; the detail, the photographs, the way it flows, the focus on key players in what helps to make style so fascinating, have all made this a brilliant read and reference book. Thank you. 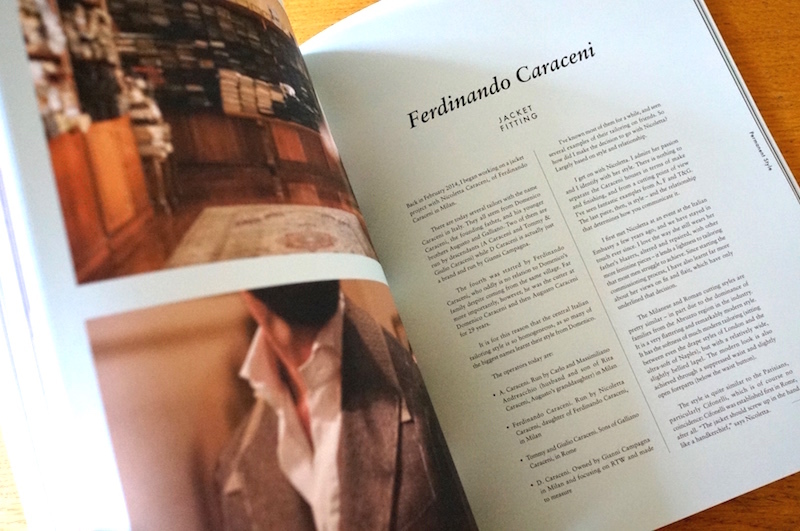 I have skimmed it from start to finish and, for some reason, find myself reading it from the back to front… No matter, I am thrilled with the finished product. A bit disappointed. The book arrived today. It was slightly damaged in transit but the real disappointment was inside. I had read that you were autographing 2,000 copies. My was not autographed. Instead I had frontispiece telling me about the Hangar Project. I like Kirby’s website and have shopped there once or twice but the lack of autograph was to repeat myself, disappointing. Were all the copies he distributed not signed? On content it’s excellent and only addition I would have asked is something on some icons such as G B Boyer. I look forward to your next issue. Thanks Ray. They were all hand-numbered, not autographed. Let me know if there is somewhere it mentions autographs and I will make sure it’s changed. Kirby’s copies are the same as everyone else’s. Thanks on Bruce – will bear that in mind. He actually emailed today to say how much he liked his copy, which was nice. Oh, and it wasn’t that only 2000 were autographed. Only 2000 were, and ever will be, printed. Thanks Simon. Appreciate the clarification. I’ll take a closer look for the numbering this evening. i’m really curious about your book, but it seems impossible to find GMT in shanghai. the outcome for any internet search related to “gmt” is useless… could you share more details about this store and its location? GMT was only a pop-up shop, so it’s not around any more. I’ll change that on the post. You can order it from Brio in Beijing – that’s probably the easiest option if you’re in China. brio is on my list of shops to visit and i’m heading to beijing soon … hope they still have books in stock and i’m able to get one there. I have paid for the book several weeks ago. Any idea when I’ll receive my copy? Trying to order a copy of the permanent style 2015 book via the uk hanger project site but it will not allow me to add a copy to the cart….. Any ideas?